When it comes to food and authentic food culture there are no better people to learn from than the French. Their attitude towards food is so unique, that in 2010 the French Gastronomical Meal was enlisted as part of the UNESCO World Heritage. However, France is not only a leader in the preparation of food but also a leader in the reduction of wasted food and household food management. Over the last 5 years, France has implemented a large number of food reducing policies and initiatives, which we already shared with you in the first part of this series, How the French are Leading the Revolution of Food Waste Reduction – Part 1. France’s leading position of food waste control on public level has more profound reasons than simply progressive policy-making. It is rooted in the deep-seated French believe that food is to be cherished and not wasted. 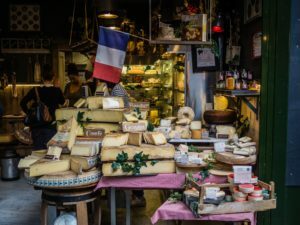 In this 2nd part of the series dedicated to France, we look at what the French know about food and household food management, that makes them so mindful about the way they consume and preserve it. Here are 6 French Food Habits that we can adopt as part of our effort to reduce food waste at home. 1. The French go an extra mile to buy quality produce from local suppliers. Every French town and village has a farmer’s market, which is affordable and available to everyone, almost every day of the week. Being a large agro growing nation, the French are proud of their fruit and vegetable produce. Every household buys bread from their boulangerie of choice. They are also very likely to have their personal meat vendor with whom they will exchange ideas for recipes for particular cuts and occasions. Instead of buying discounted bulk food during supermarkets sprees, the French go for careful meal planning and buy in smaller, necessary quantities. Fridges in France tend to be much smaller than in the U.S., and they are never fully stocked, as most of the food is consumed on the day. The lesson to learn is that investing in quality produce and buying only as much as is needed, eliminates the challenge of keeping track of all the purchases and letting them perish. 2. The French invest time in preparing their food, from scratch, making meals the highlight of the day. Preparation time in British households has shrunk from two hours to 15 minutes over the past years. Unlike many modern women all over the world, their French counterparts have not lost the connection with household food management. Skills and recipes are passed on, from mother to daughter, through generations, and are perfected by experience. The take away is, that when time and effort goes into food preparation, one is less prone to throw it away. Unlike that unfortunate piece of frozen pizza or the half-eaten spaghetti bowl with the ready-made sauce that is highly likely to end up in the bin. 3. In France, food is all about sharing. 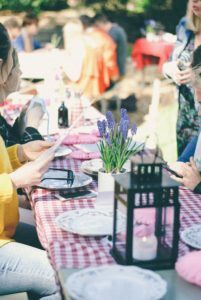 “Food is a collective concern, almost a form of communion: the idea of sharing is a key part of the meal,” says Thibaut de Saint-Pol, a sociologist at the Ecole Normale Supérieure in Cachan. Approximately 75% of all the food in France is prepared and eaten at home, while 80% of all the meals are shared with other people. 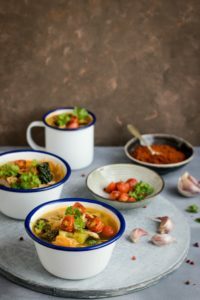 “Meals are strongly associated with good company and sharing,” says Loïc Bienassis, a researcher at the European Institute of Food History and Culture. Regarded as a ‘full-time’ activity, meals in France are “one of the best bits of the day,” comments Saint-Pol. Dinner is a formal affair with a fixed starting time, when the family gathers around the table to socialize. 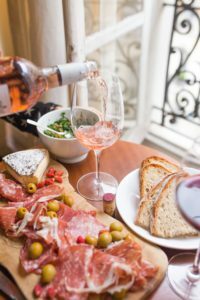 The French like to take time with meals – they eat the longest, compared to other Europeans, two hours, 22 minutes a day in 2010, and unlike most other nations, this number is on the rise – currently, it is 13 minutes longer than in 1986. So, it is unlikely that meals will be skipped or exchanged for the last minute decision to eat out or order in. Such a ritualistic attitude towards family meals allows for a precise meal planning routine and a constant food inventory overview. There is little chance that food will go bad unnoticed. 4. The French see leftovers as ideas for new dishes. Because the French make their meals form real food and quality products and prepare everything from scratch, they cherish the leftovers and use them as valuable ingredients for a quick lunch, an easy dinner, or a no-fuss side dish. The idea of discarding perfectly good food is close to a heresy. 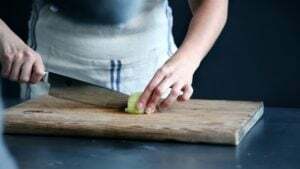 The art of turning leftovers into surprising new dishes is a valuable household food management skill that every French woman has inherited from her mother. With such an attitude toward food, waste is an unlikely result. 5. In France, food is seen as a pleasure; there is no guilt attached to enjoying the food. No foods are off limits for the French. Yet everything is consumed in moderation and in smaller portions, sitting down and without haste. Unlike the Anglo-Saxon Protestant countries, where the relationship with food tends to be Puritan and functional, “France has a Roman Catholic tradition which sustains a sensual, hedonistic relation to food,” says Pascal Ory, a professor at the Sorbonne in Paris. This healthy psychological attitude towards eating prevents the French from engaging in a love-hate relationship with food and buying stuff that is later discarded uneaten. Food is to be cherished, and never let to perish. 6. The French insist on maintaining proper work-life balance. Life is not to be sacrificed to work, and so is mealtime, being an integral part of French life. 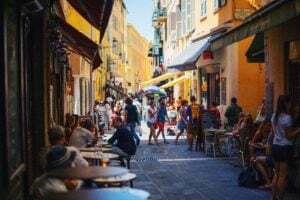 Apart from having the shortest working week in Europe, France has also recently passed a law, granting the right to disconnected time after work to all employees. The French insist on taking proper sit-down lunch breaks in the company of their colleagues, and eating in front of the computer, is perceived as a form of anti-social conduct. Not feeling constantly overwhelmed by work and being able to sustain a balanced lifestyle, provides the French with sufficient energy to be mindful of their food and prevent it from being wasted. When it comes to food and household food management the French have a lot to teach the rest of us. As a nation that has invented le repas gastronomique français, food in France is so much more than simply a utilitarian pursuit. The French attach a whole set of values to the selection, purchase, preparation, consumption, preservation, and reuse of food. For many of us, our attitude towards food has been strongly influenced by the modern times we live in, and our regard for food is very low. But it seems that the French have been bypassed by this modern epidemic and they still hold food in high regard, just like in the old times. We feel inspired. So let us toast our wine glasses and cherish our food the way the French do. After all, we can all do with a little more joy de vivre!